He is so cute!! They are so cute together! Froggie delicious in the house. I sure hope they’ve washed their froggie hands he he he he he! What a great illustration. You can see they are so much in love!!! Good idea. And in the other side how was Prince? I have been blessed. TY my sweet. For you are truly my beautiful princess. 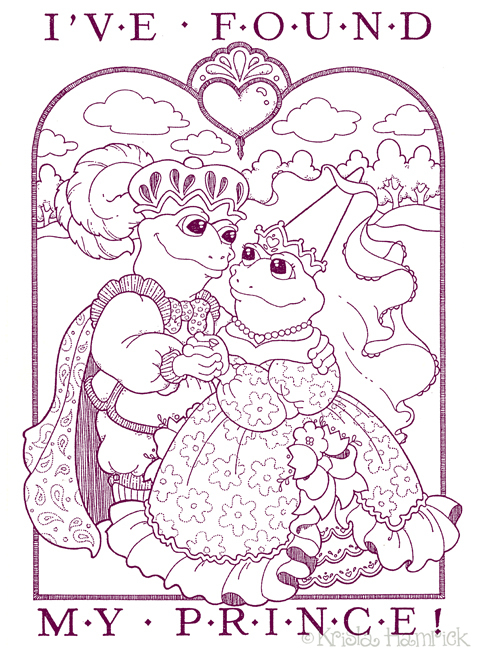 Oh how delightful, I love the idea that he’s a frog and they live happily ever after! YEAHHHHH! Awwwww, so sweeeeet! The detailing in their clothes and the frame is magical. And their eyes! They only have eyes for each other. *sigh* This is the same couple as Jack’s restaurant picture after the waiter came back and gave them both extra servings of flies, right? Perfect! I have never thought of this concept. So fun and creative. ha, I thought about this for reverse too, how strange, but I love yours! Charming and fun, great take on the theme… I am struggling with this one. Usually IF images come pretty readily to mind. Such fetching detail on the clothing of the happy couple! I love the paisley on his cape. How lovely. The line work is wonderful! This would make such a great set of playing cards! You have her dreaming of their life together and I have her dreaming of getting out of there without too much more humiliation :o) We make a great tale! I love all the detail in the clothing! WOW! Glad you posted this! Hey thanks for noticing that she was embarrassed. That’s what i was going for without being too obvious! You know your frogs! :o) Your work is so delightful and enchanting! perfect fairy tale style Krista! Very sweet and nicely done.